Exporting to an iCalendar (ics) file will enable your calendars to be shared with others, as long as they're either using VueMinder or another program capable of importing iCalendar files. The calendar to be exported is selected from the drop-down list. Only event calendars will be listed. Note and task calendars are exported using the Export Notes and Export Tasks commands on the File menu. 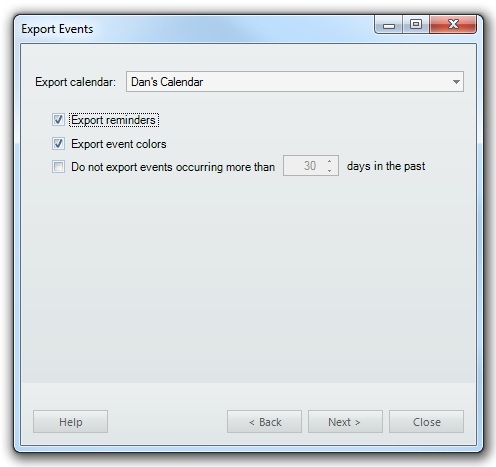 All events belonging to the selected calendar will be exported, unless the setting to exclude older events is enabled. To include reminders in the output, check the "Export reminders" option. The full reminder status and settings will be exported, which other instances of VueMinder can import. A standard reminder definition will also be exported which other calendar programs can understand, but will be missing many of the advanced settings provided by VueMinder. To include event colors in the output, check the "Export event colors" option. Note, this data is an extension of the iCalendar file format and will likely be ignored when importing into other calendar programs. Only VueMinder will be able to import the same event colors and appearance settings that are exported. You can also choose to exclude events older than a specified number of days from being exported. This could greatly reduce the size of the exported file, if your calendar contains many events going back several years or more. After you've selected a calendar and the desired settings, click the Next button. A window will appear where you can specify the name and location of the exported ICS file. If the file already exists, it will be overwritten. 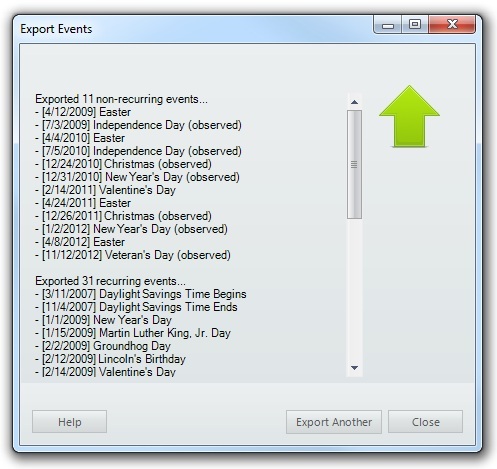 The export results will be displayed, where you can see the number of events that were exported. 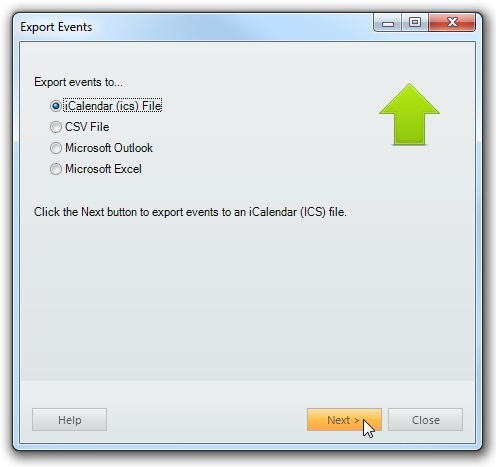 To export another calendar, click the "Export Another" button. Otherwise, click the Close button to close the window.